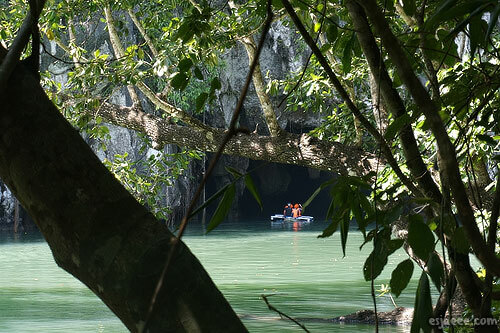 We purchased our Underground River (Subterranean River National Park) with Calamian Island Travel & Tours through our accommodation. The package included transport to and from the attraction, complimentary lunch buffet and the activity of course. The package included a tour guide as well that really explained us the history of Palawan and its economic and environmental policies. Our tour guide was known as Mommy Con and I highly recommend that you specifically ask the travel agency for her for the packaged tours. She explains things with passion and knowledge. Let's face it, most tour guides nowadays commercialize the destination and I do not blame them since it is their job to sell it to their consumers (I could not help but be like this as I do this in college and I will be doing this for another year and a half! 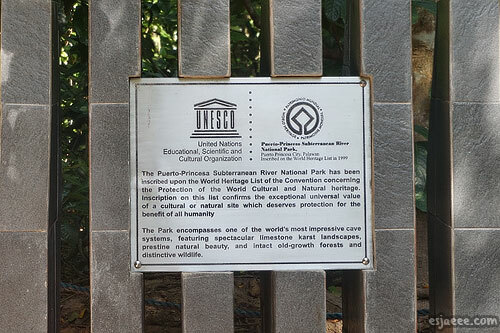 ), but with Mommy Con, I could see that she cares about the region of Palawan in terms of preserving it and making it a sustainable destination. 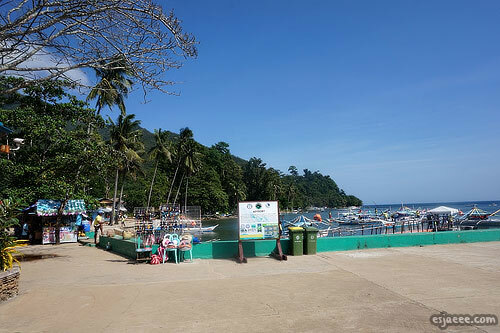 The drive to the Underground River was almost 2 hours from our accommodation. We stopped at this rest stop for toilet break. 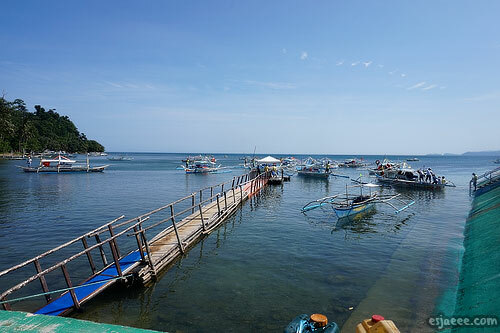 I do not remember what this place is called but our tour guide said that many tourists stop by to take a panoramic photo of Honda Bay. There are also small shops present where you could by souvenirs! 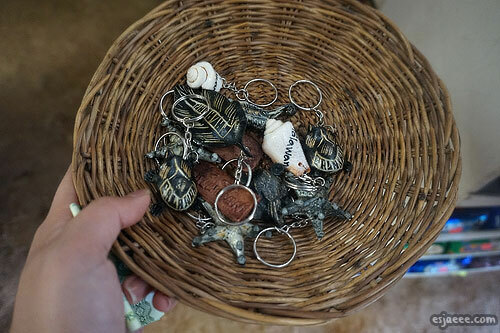 The keychains were on offer for PHP 120 for 10 keychains! I thought it was such a steal! There were also shops that sold food and drink. I suggest getting buko (fresh coconut) juice! It is truly refreshing! An hour later, we have arrived at this place that I think they called boat warps. 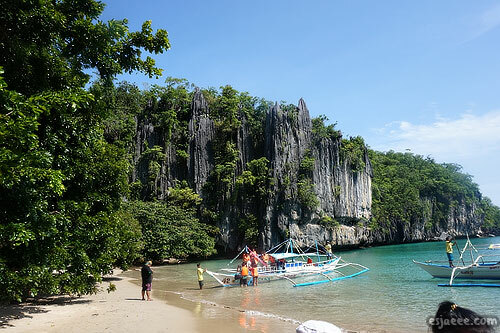 The boats parked at the sides will bring you to the island where the Underground River is. We were a bit frustrated with the pricing of the place. Since we are not Filipino citizens, we had to pay more. Locals' fee was about PHP 200 which was about €3.86. International visitors' fee was about PHP 750 which was about €15! Talk about a huge difference! After paying, we had to wait for our assigned boat number to be called. 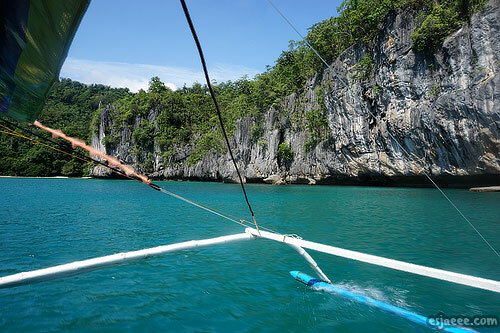 We then had to go to the wrap and take a 5-10 minute boat road to the island where the Underground River was. I could not help but fall in love with this beauty! It was very picturesque! 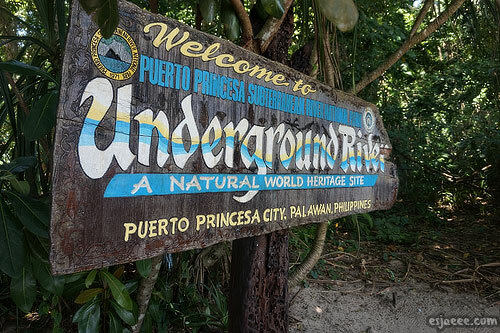 Puerto Princesa Subterranean River National Park, or Underground River as I call it is part of UNESCO's World Heritage Sites that preserves and protects the place. There was a little trail for us to walk through to get to the waiting area to go in to the caves. 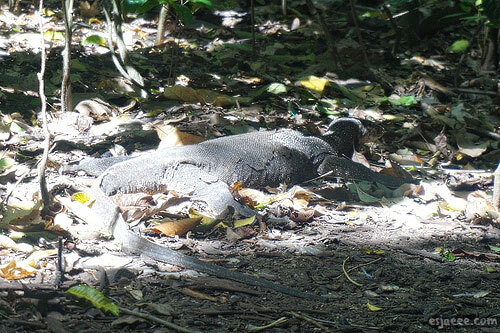 As we were walking along the trails, we were amused to see a huge monitor lizard just casually chilling at the sides of the trails. There are signs in the place saying not to chase these creatures. 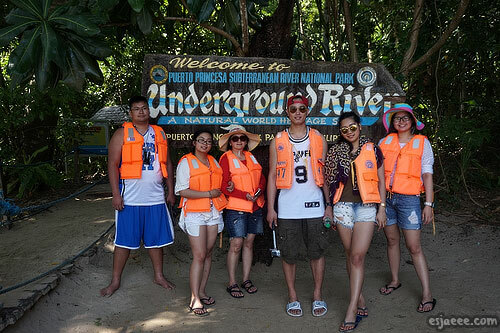 Since the Underground River park was a habitat of many animals, we were told not to bring any food and plastic with us. 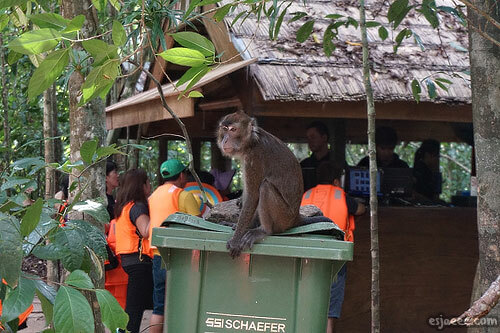 One of the tourists from another tour group brought food with him and the monkeys started coming out of the trees and stood idly outside the waiting sheds. That was the cave we had to go into! At this point, I was so excited to see what the cave had to offer! 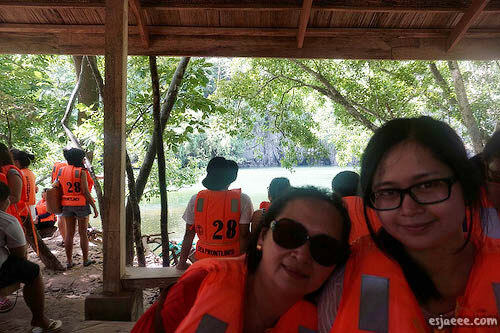 My momma and I waiting for another boat to bring us in the cave. We were give life vests and protective helmets to wear for protection. The person sitting at the front of the boat was given the helmet with an attached flashlight. 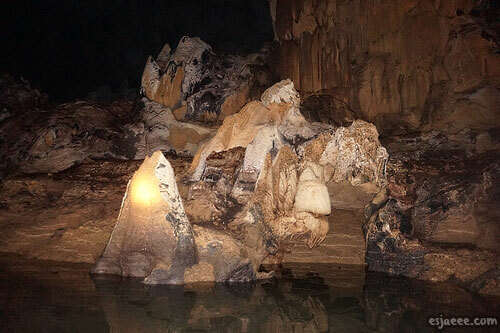 Each boat had a tour guide that explained the stalagmites and stalactites. As we entered the cave, we could hear the bats. It was also pitch black inside but the flashlights helped us see the rock formations. 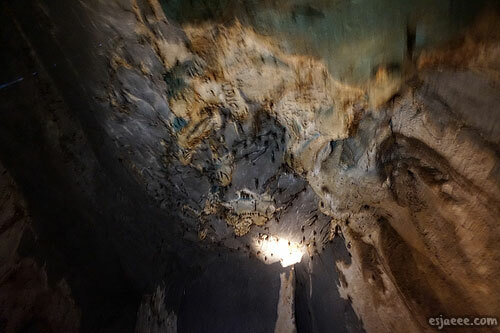 There were also these things called guano which are basically bat poop that was at the side of cave walls. This guano is a very good fertilizer that keeps the river healthy and its habitants. This tour was quite entertaining as there were "sections" that has its own theme. Some of the rocks resemble a boxing glove, a huge candle etc. There was even a part of the cave that was called "The Cathedral" since there were rock formations that looked like Jesus in Bethlehem. There was a certain distance tourists were allowed to go. 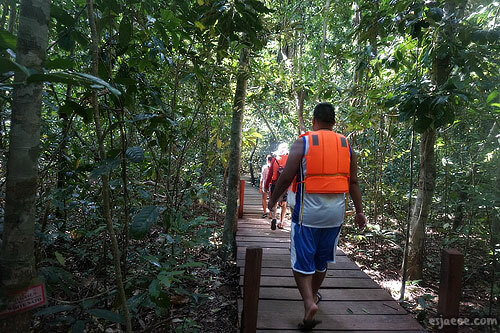 A special government permit is needed if tourists would want to go beyond the distance limit. We really enjoyed this experience. Mom and I voted this place as one of the Seven Wonders of the world back in 2011. 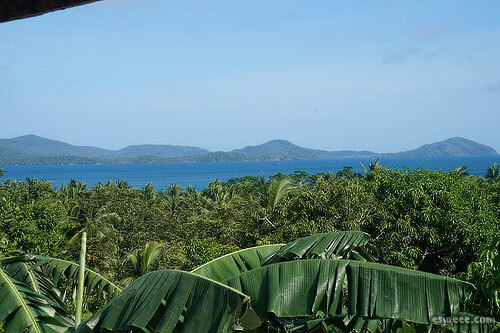 I highly recommend people visiting Puerto Princesa to go here! You guys did not think that our second day was over?! After this, we headed over to Ugong Rock so look out for that post! Let me know if you guys liked this post! 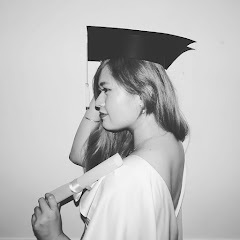 And also don't forget to subscribe to my blog for more updates!